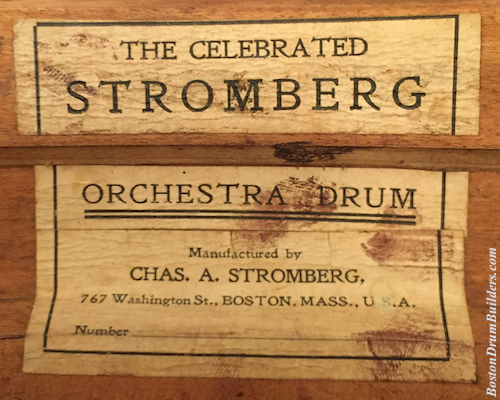 From Gary Wolprt in Mason, New Hampshire comes this early single tension Orchestra Drum by Boston's Charles A. Stromberg. 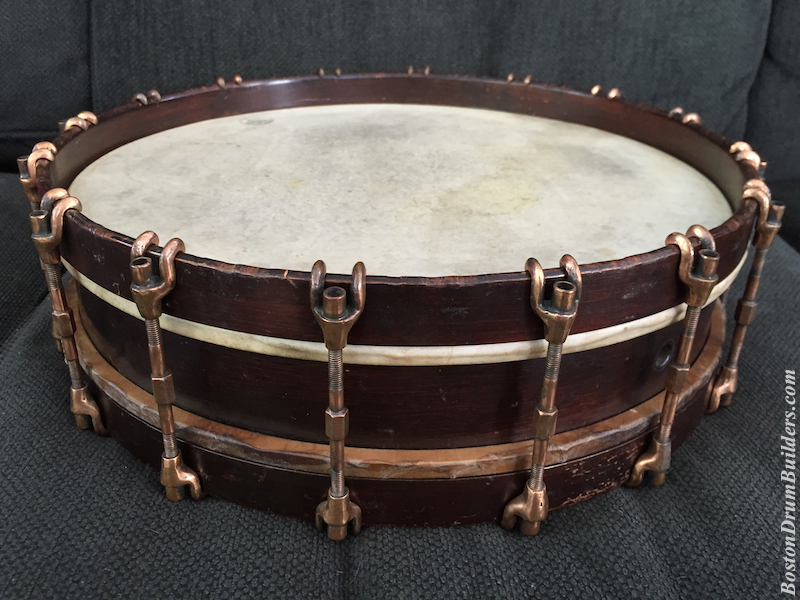 The drum was long ago refurbished but much can still be pointed to as evidence of Stromberg's craftsmanship and ingenuity, and his evolution as a snare drum maker. Most interesting about the drum is the hardware used to tension the heads, a method sometimes referred to as 'double tension'. This is in fact merely another form of single tension where both heads are tuned simultaneously. The main distinguishing feature of the so called double tension tuning method is that the tension rods are adjusted from the side of the drum with the use of a key, not from the top or bottom using thumbrods or more conventional tension rods. The claws used here (above center) are an interesting modification of those typically employed by Stromberg. In order to better accept the tension rods, or perhaps to emulate the look of slotted tension rods being fitted into the claws from above, each claw has a fixed cylindrical segment which is permanently affixed. The tension rods are then threaded in a different direction at each end so that turning the rods adjusts both heads at once. An unusually fine threading gives the player added control over fine tuning, though it would mean more turns to bring a damp drumhead up to pitch. Stromberg may have chosen to apply this so called 'double tension' method for one of several reasons. Firstly, this was likely intended as a lower level model than his patented Stromberg Invincible Orchestra Drum which was being produced contemporaneously. 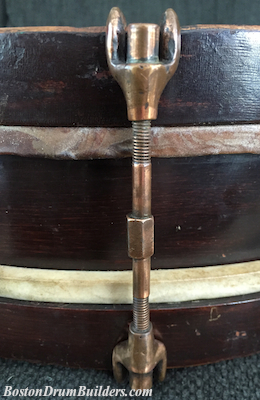 Another possibility is that a customer specifically requested a drum with this tuning method as there was still much discussion during the early 1900s as to the merits of single tension versus separate tension. The label applied inside of the drum tells us several things beyond the fingerprints from some less than careful shell refinishing. For one, the address listed, 767 Washington Street, is not often seen suggesting that Stromberg only operated here for a short period of time. The same address is handwritten inside of the previously referenced Invincible Orchestra Drum with a date from March of 1906 placing the drum featured here sometime shortly thereafter. 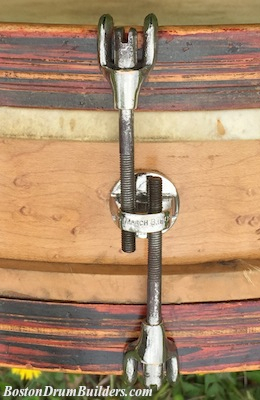 Also noteworthy is the omission of the word "Invincible" which tells us that the maker did not want us to confuse this drum with his patented design featuring separate tension lugs. 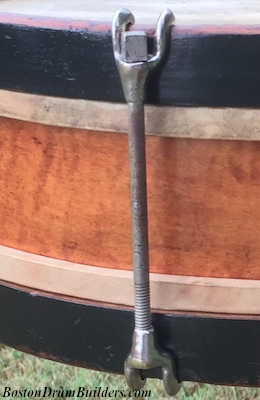 Unfortunately the original snare strainer is no longer present (a plugged hole in the shell prior to it being refinished confirms this modification) leaving us to wonder what exactly was there in the first place. And the hardware which now appears a copper-ish hue was likely nickel plated upon leaving Stromberg's shop. For that matter, the original color of the drum may have been something very different from the very dark stain it now wears. But the shallow one ply maple shell is as refined as any made by Stromberg. And as usual the drum has a subtle elegance about it due in part to Stromberg's claws which were more streamlined that those of other makers of the era. A new slunk head from Stern Tanning tucked onto the original flesh hoop has this drum back in service once again. Special thanks to Gary for allowing his drum to be featured here! Do you have a drum made by Charles A. Stromberg? I want to hear from you! Feel free to drop Lee an email anytime at lee@vinson.net. And for more on the early 20th century snare drum makers of Boston, Massachusetts please visit BostonDrumBuilders.com.